WordCamp Kathmandu 2019 will be held on the 16th and 17th of March at Bougain Villa Events, in Tripureshwor, Kathmandu. Similar to the last year’s WordCamp, WordCamp Kathmandu 2019 will also be a two-day event this time –16th being the official WordCamp day, and 17th being the Contributor Day. Those who are not familiar with what a Contributor day is, it is an event dedicated to giving back to the WordPress project, often paired with a WordCamp. Those who want to make their first foray into getting involved with WordPress (regardless of your experience level) and its team can attend the Contributor day. Even someone who knows very little about WordPress can contribute by answering support questions. On the Contributor day, attendees break up into different teams and focus on a particular segment of WordPress. You can join whichever team you want to. Some of the teams you can work with on the Contributor day are Accessibility, BuddyPress, Community, Core, Design, Documentation, Flow, Marketing, Meta, Mobile, Polyglots, Support, Themes, Training, and TV. All the teams will be led by someone who will help the attendees. The team leaders will organize their contributor team and lead them throughout the event. 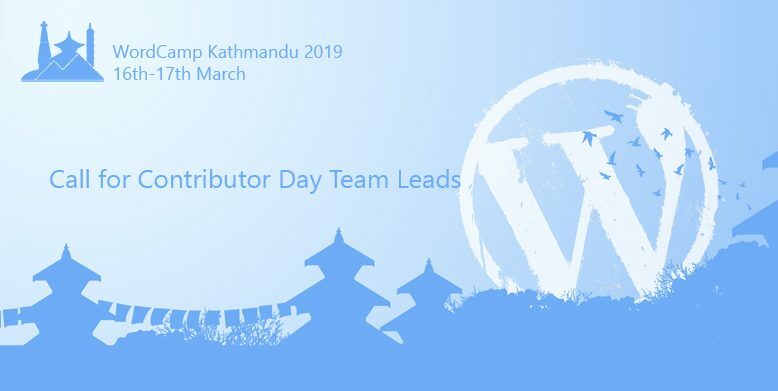 If you also want to contribute or have already contributed to WordPress before in any WordPress area and want to lead any specific team, then you can fill up the Call for Contributor Day Team Leads Form available on the official website of WordCamp Kathmandu 2019. Are you excited about the Contributor Day? Have you booked your seat for WordCamp Kathmandu 2019 yet? If not, we suggest you do so right away. WordCamp Kathmandu 2019 is a great opportunity to get to know about the community and grow your knowledge. ← Previous Previous post: WordPress 5.1 Beta 3 Now Available for Testing! Next → Next post: WordPress Birgunj February Meetup 2019 Announced!